By Kyle Roderick, Contributor. Forbes. Fri, 26 Apr 2019 03:15:00 +0000. Kansas City Chiefs quarterback and reigning NFL MVP Patrick Mahomes will be featured on the cover of the "Madden NFL 20," EA Sports revealed on Thursday. Reuters. Thu, 25 Apr 2019 19:22:31 -0400. By Brian Mazique, Contributor. Forbes. Thu, 25 Apr 2019 22:45:00 +0000. ABC News. Thu, 25 Apr 2019 16:03:57 -0400. Brian Robbins. American City Business Journals. Thu, 25 Apr 2019 19:51:37 +0000. ABC News. Thu, 25 Apr 2019 13:20:12 -0400. ESPN. Thu, 25 Apr 2019 07:55:44 EST. Prosecutors in Kansas have announced they will not proceed with charges against Kansas City Chiefs wide receiver Tyreek Hill after investigating two incidents at his home involving a child. Daily Mail. Wed, 24 Apr 2019 22:43:58 GMT. Yahoo. Wed, 24 Apr 2019 18:13:13 -0400. Samuel Chamberlain. Fox News. Wed, 24 Apr 2019 21:55:50 GMT. Missouri State women's basketball icon Jackie Stiles is leaving the school to be an assistant coach at Oklahoma. News 9. Wed, 24 Apr 2019 17:39:00 EDT. For most people, chronic back pain can be debilitating and define who they are. But according to Ross Mattox, the cure is all about the patient straightening up their own lives. Brian Robbins. American City Business Journals. Wed, 24 Apr 2019 17:25:25 +0000. Jim Salter. Fox News. Tue, 23 Apr 2019 21:13:41 GMT. According to the 2010 census, the population of Missouri was 5,988,927. In 2008, the estimated population of Missouri was 5,911,605, whereas in 2006, the population of Missouri was about 5,832,977. For detailed, up-to-date information about Missouri's demographics, visit the U.S. Census Bureau's QuickFacts about Missouri web page. For maps of Missouri, visit this Missouri Map website. 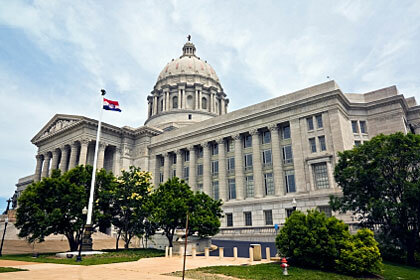 The photograph above shows the state capitol building in Jefferson City, Missouri. Missouri newspaper publishers are listed here, along with their addresses, phone numbers, and website links; Missouri library names, descriptions, and website links are listed on this page. More information about Missouri can be found here.